The Gaslight Anthem frontman Brian Fallon claims that Pearl Jam have inspired his band's plans for their next album. The New Jersey four-piece, who only recently released their fourth album 'Handwritten', already have ideas for their fifth LP according to frontman Brian Fallon. He told Rolling Stone: "I want to do the 'No Code' record [Pearl Jam's fourth album], that one. They did these three rock records, and [then] they all of a sudden went left turn. And everybody went, 'What the hell?' Then later, five years, they went, 'This is amazing.'" He added: "We're searching for something new to do with songwriting, rather than just piecing together verses and choruses in more of a traditional sense. We're looking for some other thing – not some other genre, but something else. And it might not be the favourite of everyone, but [it] might be the 'weird' album coming up. I'm pretty sure it is." jonester wrote: I'm getting nervous! So am I. I'm curious to see what they actually mean by "weird" album. I'm guessing it will be something very different to what were used to. With that said, there will obviously be the influence of what they have done previously so I think a lot of people will like it. I really hope that don't release something different to try to change things and it ends up being terrible. I hope the new album is not a compilation of songs like holloween, I'm just not crazy about that song or that direction should they happen to pursue it. I understand artists and the artistic privilege that they deserve, but they also must remember what got them to where they are. 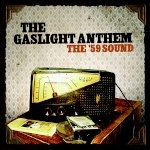 Gaslight Anthem , in my opinion, really is the best rock n roll being made today. Should they continue doing what they're doing they will no doubt be a huge sensation. I feel albums like sink or swim and handwritten are as close to perfect as one can get. and though I get nervous about hearing these things, if anyone can do it its Brian. jonester wrote: I hope the new album is not a compilation of songs like holloween, I'm just not crazy about that song or that direction should they happen to pursue it. I understand artists and the artistic privilege that they deserve, but they also must remember what got them to where they are. Gaslight Anthem , in my opinion, really is the best rock n roll being made today. Should they continue doing what they're doing they will no doubt be a huge sensation. I feel albums like sink or swim and handwritten are as close to perfect as one can get. and though I get nervous about hearing these things, if anyone can do it its Brian. i agree about sink or swim and handwritten. Sink or swim is my favorite gaslight album. Gaslight can go in any direction they want, but i want there to be at least 2 or 3 fast rock and roll songs so then they can still keep the rawness that i love about gaslight. jonester wrote: but they also must remember what got them to where they are. I think this is super important. I agree that they have produced the best rock n roll today, at least from what I've heard. I really hope they keep putting out new stuff that is excellent. Should they continue doing what they're doing they will no doubt be a huge sensation. Brian has said many times that releasing the same stuff as a similar album is cheating your audience. I'd have to agree. So far, they have not released 2 similar albums, but all have been excellent. I'm excited to see what their next brings, though I have to listen to their past albums even more. I'm not sick of a single song yet. A band can still make the same style music without being redundant. As long as the fans enjoy the music and lyrics, who cares if its not drastically different than previous albums. Especially when no-one else is even close to being similar. Look at Springsteen, I love the guy but his new music is so far removed from earlier albums that very few songs sound remotely close to "born to run "or earlier albums. He's "progressed to a point where I believe his music is suffering and becoming a bit stagnant. What I'd give for an album of songs like "rosalita" , "born to run", "for you" "badlands" "prove it". I'd hate to see such a talented band like gaslight fall into the same trap. this probably won't happen to me, but if I end up not being a fan of the new album, I will just not listen to it because the gaslight library is pretty big now with about 40+ songs. hsmall wrote: this probably won't happen to me, but if I end up not being a fan of the new album, I will just not listen to it because the gaslight library is pretty big now with about 40+ songs. Likewise. The great music they've already produced will never be gone. Keep rockin' TGA.